It’s 1988 and I have been hired by Widji as a Northwester. While I don’t remember a lot of staff training, I very vividly recall our staff break-in trip. My leader was Brenda Cram (who has her back to the camera in this photo). Jeff Benjamin (also in the photo) was on our trip along with (and I think I’m recalling the rest of our group correctly, although I think I’m missing a person or two) Slater Neimeyer, Rollie Brusseau, Dave Mink and Cindy Pierce. We paddled out from camp and headed to Crab Lake. I shared a pack with Brenda and the reason I recall this is because I learned a very valuable lesson from her about how to manage a campsite. Brenda claimed she was paranoid about rain showers popping up at any time and always kept her pack closed with the liner rolled up. This was new to me but it stuck with me for years. Since that time I have always kept my pack liner rolled up and pack closed and taught all my campers at Widji and with other organizations to do the same. The only other thing that stands out from this trip was that somewhere along the portage back out of Crab, one of our group members “injured” her knee and was unable to put any weight on it. So we carried her across most of the portage. Unbeknownst to us it was actually a simulation, which she disclosed to us at the end of the portage. 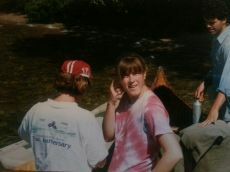 I was a camper for 6 years, ending with my Voyageur trip in 1985. My children now attend Widji. I think about why I want my boys to experience Widji, and I there are so many reasons, but perhaps the most valuable for me as a child were these. I had the chance to be away from everything I knew: my family, friends, school and report cards, city life. It was my world that no one else in my "regular" life ever experienced. That is priceless. I felt not only independent but also connected to the nature I was surrounded by. I loved the hard work, perhaps because it was such basic labor and perhaps because it wasn't being evaluated or judged by anyone but myself. I was able to try new aspects of my inner personality, and build relationships with people I might never see again. I loved the monotony of the everyday: get up, make breakfast, break camp, canoe, portage, eat gorp, canoe, sing, set up camp, cook, clean, sleep, repeat. Wonderful! I loved the singing. Singing camp songs at Widji at my son's campfires now brings tears to my eyes. As a mother, I add to this the faith that my boys' physical selves will be safe while at Widji (never thought of this as a child! ), and that their spiritual selves will be protected and nurtured. I can think of no greater positive influence outside of the home on my childhood than Widji. I found Widjiwagan from a reference from another camp - seeking a camp experience that had more adventure and challenges. I never looked back nor wondered if there was something better out there. One of the things that strikes me as I think back to my 3 trips was the foundational training or what we called the "Widji Way". Getting a group all on the same page, educated in common processes, focused on a common goal, learning how to work together. We had to learn how to work together and we had good days and bad days. We had to learn how to problem solve and know that the answers had to come from us. I use these skills everyday in my job - leading a large group of individuals in multiple time zones, and countries. Since my experiences as Widji, I have encouraged many other family members to go to Widji. We have watched as my nephew Tyler went on to be a Mountaineer and my cousin Lisa went on to do a Voyageur trip. All of my 3 children have attended Widji as well. I believe that it is an experience that you can't get anywhere else. Life changing. That's usually how I talk about it.